Always striving to meet the needs of every user, DeSantis continues to produce a diverse, high-quality product line with reliable performance in the field. 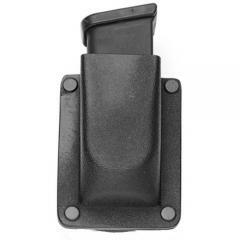 The new A62 Kydex Single Magazine Pouch delivers secure magazine retention in a compact, durable and weather-resistant package. The holder is secured with a reinforced belt clip and rides close to the body for easy concealment. Its snug positioning allows the A62 to be easily covered by a tucked in shirt or jacket with no signs of visible printing. An internal retention device delivers the ideal amount of friction to keep magazines secured while still allowing for quick retrieval when needed. The holder fits belts up to 1.75-inches wide.